Running into an unfamiliar species is always an interesting experience, identification can be challenging, with plenty of trial and error. Even with the power of the internet behind you, information can be limited and frustration is common. However, when you finally get that “Eureka!” moment and find a match, what follows is a rush of adrenaline and an excited flurry of research. In the meantime, having a distinctive species smugly sit in front of you while being unable to identify it is hair-tearing. Never has this experience been more pronounced when I was faced by this species at Bukit Brown Cemetery. 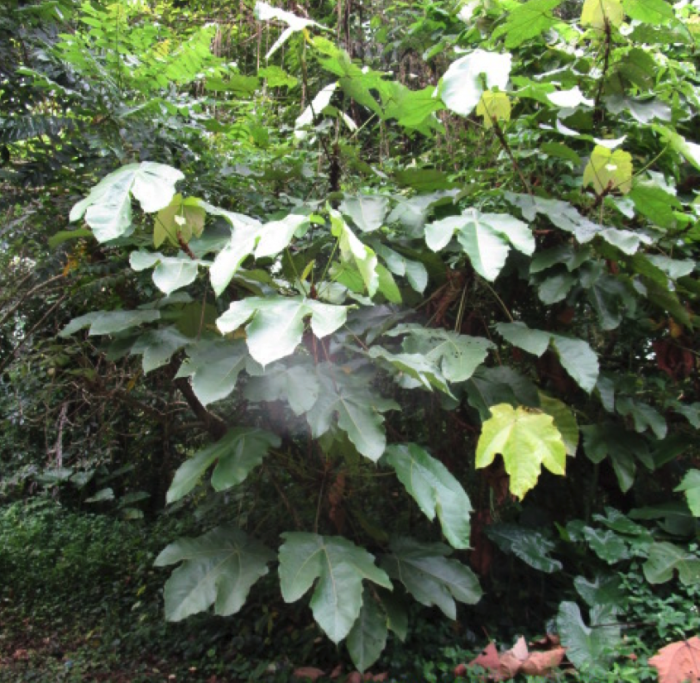 I felt stupid for the longest time when I could not figure out the name of such a distinctive plant with its absurdly large tri-lobed leaves. The specimen shown above is a small one. Mature individuals in the cemetery reach about 15m high. Big leaves. Colleague for scale. It was only when I ran into its cousin the Common Mahang (Macaranga bancana) that something clicked. 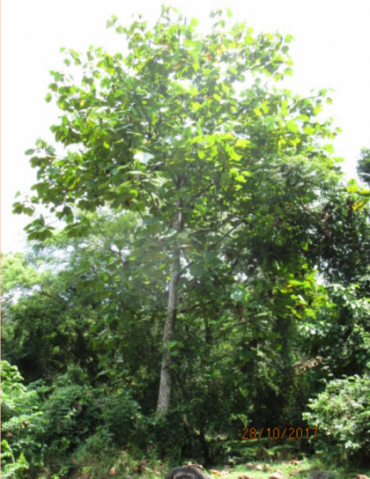 This is the Giant Mahang (Macaranga gigantea). 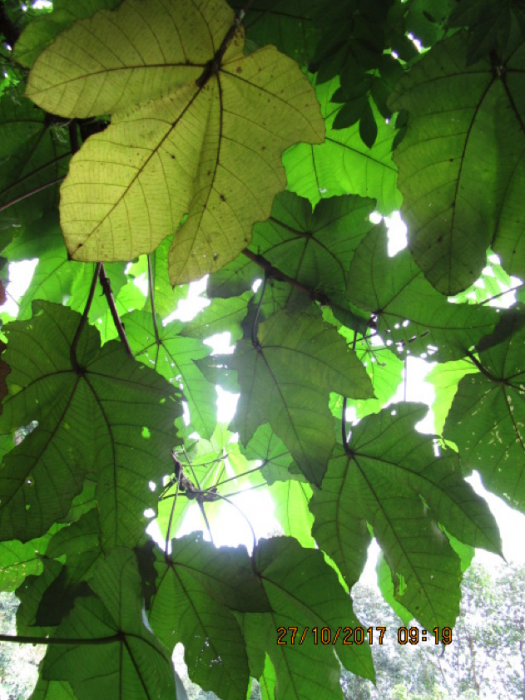 While the leaves are similar in shape to the Common Mahang, they are much larger, and its twigs do not contain mutualistic ants like its Common cousin. 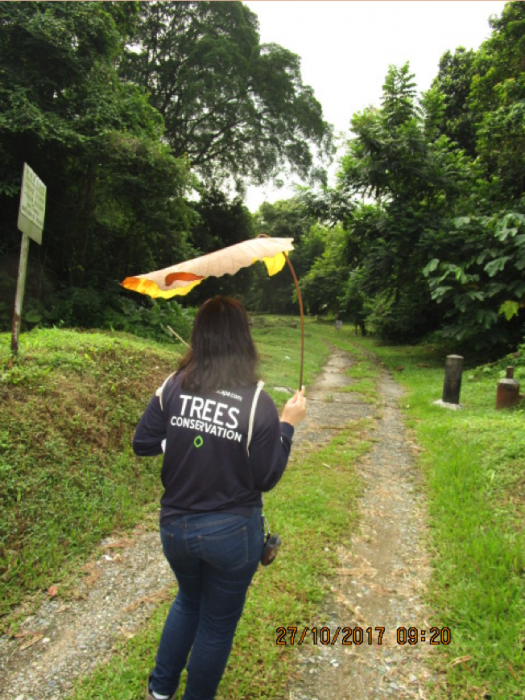 Its role as a pioneer species fit the Bukit Brown Cemetery perfectly. Closed to new burials in 1973, secondary rainforest has been slowly reclaiming much of the area. Large tracts of open disturbed land? Perfect for the Giant Mahang. Given enough time, these trees are eventually overtaken by larger, shade-tolerant competitors. However, the copious amounts of small fruit that it produces while it is alive ensures dispersal by animals to other open areas.